The Magnetospheric Multiscale (MMS) mission is a Solar Terrestrial Probes Program mission within NASA’s Heliophysics Division. 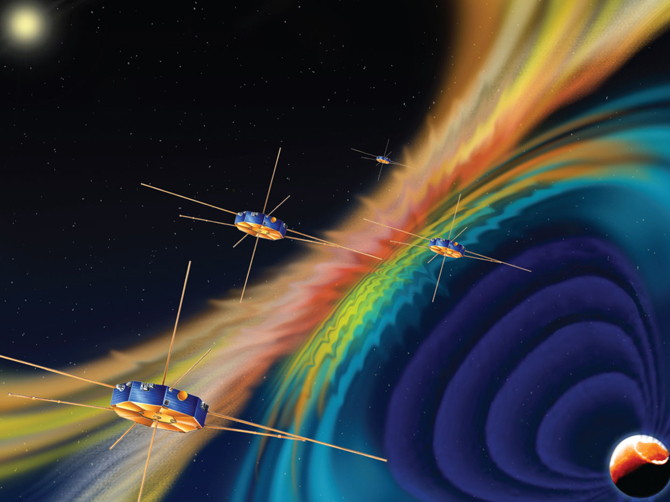 The MMS mission, consisting of four identically instrumented spacecraft, uses Earth’s magnetosphere as a laboratory to study magnetic reconnection, a fundamental plasma-physical process that taps the energy stored in a magnetic field and converts it—typically explosively—into heat and kinetic energy in the form of charged particle acceleration and large-scale flows of matter. The four MMS spacecraft carry identical suites of plasma analyzers, energetic particle detectors, magnetometers, and electric field instruments as well as a device to prevent spacecraft charging from interfering with the highly sensitive measurements. The plasma and fields instruments measure the ion and electron distributions and the electric and magnetic fields with unprecedented high (millisecond) time resolution and accuracy. These measurements enable MMS to locate and identify the small (tens of km) and rapidly moving (10—100 km/s) diffusion regions, to determine their size and structure, and to discover the mechanism(s) by which the plasma and the magnetic field become decoupled and the magnetic field is reconfigured. MMS is collecting the first unambiguous measurements of plasma composition at reconnection sites, while energetic particle detectors remotely sense the regions where reconnection occurs and determine how reconnection processes produce large numbers of energetic particles. The four satellites launched together on an Atlas V-421 launch vehicle and were successfully inserted sequentially—at five-minute intervals—into Earth orbit. As they explore the dayside and nightside reconnection regions, the spacecraft fly in a tetrahedral (pyramid) formation, allowing them to capture the three-dimensional structure of the reconnection sites they encounter. Onboard propulsion is used to adjust the separation among the spacecraft—from hundreds of kilometers to as close as 10 kilometers—to achieve the optimum inter-spacecraft separation for probing the diffusion region. What conditions determine when reconnection is initiated and when it ceases? What determines the rate at which reconnection occurs? What is the structure of the diffusion region? How do the plasma and magnetic fields become decoupled in the diffusion region? In particular, what role do the electrons play in facilitating reconnection? What is the role of turbulence in the reconnection process? How does reconnection accelerate particles to high energies? LASP built several key components to the MMS FIELDS investigation instruments. This includes the door and preamplifier assemblies for the Spin-plane Double Probe (SDP) electric field instrument, the Axial Double Probe (ADP) electric field instrument including booms, sensors, and preamplifiers, and the Digital Signal Processor (DSP) electronics that support onboard capture and processing of the ADP, SDP, and Search Coil Magnetometer (SCM) electric and magnetic field measurements. Click on the image to view a PDF (721 KB) of MMS FAQs.